Happy Monday my dear blog friends. Hope everyone is well and enjoying some lovely Spring weather. Here in the Netherlands we are lucky these days the weather is so gorgeous, lol! Ok now about my project. It's Monday and that meen we do have a very lovely challenge at The Crazy Challenge for you ~"Sweet Teens". Our sponsor this week is Sassy Studio. I love the images from hun and one of you can win 4 images of your choise, just come and join the challenge this week. For my window / frame card I did use Reading Rachel. The tutorial for this card I saw at the lovely Heather's blog . Enjoy the beautiful weather with some lovely book! I want to show you today a card which I have made with one of the new romantic images designed by Victoria Case exclusive for SCACD , let's meet Scarlett Bonita, she is from the new Sweet meets Sassy collection. She is so adorable and romantic. She is coloured with Copics. The layout is clean and simple. The sentiments is from SCACD . From 5 April start the new challenge blog with a lot of fun, come and join us here. Elizabeth Bell Wold challenge ~ Easter decoration! I am a bit late with my post, ooopppsss! Today I will show you an Easter decoration which I have made for EB World Challenge blog ~ Alter it - An Easter Decoration or centerpiece as GD. 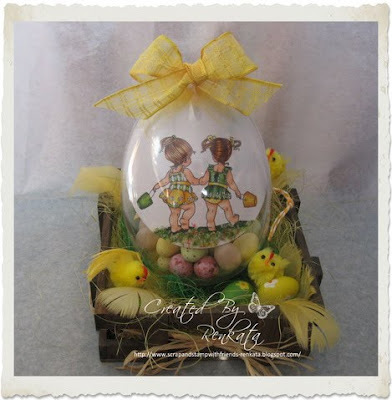 I have used a plastic egg which I altered , put inside some chocolade eggs, the image is from Elizabeth Bell digi collection - Little Best Friends. They are going to look for some eggs , lol. I coloured the image with copics , the grass is made with FlowerSoft. Hope you will enjoy it and will get inspiration to create some Easter decoration and come join the challenge. 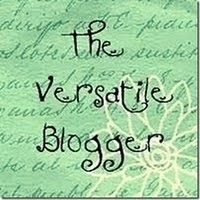 Welcome to my blog dear friends! Today I want to share with you a card and an award from a very sweet lady. Thanks dear, I am really touch. There is a rull, which I will do later. Now about my card: The image is from Carmen Medlin exclusice for SCACD . You can get yours in a set with some others amazing stamps or just this one. I coloured her with Copics in purple (V17,15,12,000) and yellow (YR24,Y19,15,11). The pink pastel pearls I have made with the Paper Pen, but at Susana's store there is so much more. My card will enter a challenge over at CMC Birthday Events ~Yellow, Purple and Cream/White . And then will be on his way to a dear blog friend whom love colour Purple! Yes, Lisa this is for you! Are you a follower of our brand new Challenge blog? Not?! Well come and join us, lol ! Grand opening 5 April with a lot of fun! Sure You don't want to miss it! This is my second post as GD for Elizabeth Bell digis. Today I want to show you one of my favorite digi image "Ginnie, Gliding with Butterflies". I saw her for the first time last year on the Lynda's blog and I just fall in love with this image, which brings so much precious memories of my childhood, lol. Like the name say "Ginnie, Gliding with Butterflies", I add a lot of butterflies. The image is coloured with Copics. I used a sketch from CMC Birthday Events I am posting this card for the challenge - "March 15th---Kick Off Party". Do you know that SCACD and friends are having a challenge blog , which kick off on 5 of April with a lot of fun stuff ......... WooooHoooo and something special for someone who is a follower of our Challenge blog. Are you one ?! Don't wait come and join us! From 5 April you can dust off your precious SCACD exclusive images and join our challenges. I am so happy that Susana and Danni organized this Challenge Blog . Thanks girls for the invitation. Digi Bells Blog Hop and a new digi image by Elizabeth Bell !!! Hello my dear blog friends! Today at the Digi Bells we do have Blog Hop to showcase the new digi image "PATI'S KISSES" by amazing Elizabeth Bell. To win the digi this time you will have to hop through and leave comments on EACH blog. There will be 2 blogs at random that the winners will be picked from the comments. card and post it on the Digi Bell Blog - "Hugs and Kisses". Using a Elisabeth Bell image. The Hop and the challenge will end on March 25 at 10 PM Arizona Time and the winner will be posted on the Digi Bell's blog the next morning. If you come from the sweet Mary Lou you are on the right place. I did make a frame using the new digi image. Isn't she cute and precious. The frame is for my lovely niece, she is 4 years old and love my craft stuff, lol. Now is time to send you to the lovely Lorraine. Today is my first post as a Guest Designer for The Digi Bells . I am feeling so happy yeeeppyyyy!!! Today is also a Mothers Day in my country. Happy Mothers Day dear Mama! This card is especially for you Mama! I used Little Rapunzel from the Elizabeth Bell Digital Collection. She is coloured with Copics. The sentiment is from Hobby Paleis. The papers, the ribbon and all other details are from my stash. Good evening or maybe morning for some blog friends! Today we have new stamps release by Sylvia and Max for Spesch Designer Stamps. I am showcasing the digi stamps Bunny with Chick by Sylvia and Goth Easter Bunny by Max. The new digi stamps and so much more you can buy at our store Spesch Designer Stamps. Here is my card with the cute image Bunny with Chick by Sylvia. My second card is with the image Goth Easter Bunny by Max. Please, pop over to our blog HERE to see what other girls came up with ! I do have a card today with the gorgeous Boho Chic from the Sampler Edition #2 exclusive for SCACD by Elizabeth Bell. I love these gorgeous and cool images. But in the Susana's store there is much more exclusive stamps. Ohh my, did you saw the new release from Victoria Case exclusive for SCACD, wow they are just wow sensational stamps. I must shop , LOL ! Ok, Now about my card. The image is coloured with Copics , for her blouse I did use Feather- Blending technique. The sentiment "Joy" is a candy from my sweet blog friend Stephanne, thanks dear. You are all invite to our New Challenge Blog- Grand Opening 5 April! Come and take a look HERE ! You don't want to miss the Fun! Wish you all a magical weekend! I do have some excited NEWS for you and I am sure you don't want to miss the upcoming FUN!!!!! SCACD will have a NEW Challenge Blog called SCACD – Friends with Heart Challenge Blog starting April 5th. ( One day before my Birthday!) . We are going to try and make it different and Fun. During our April debut month we want to do it up special, so we will have awesome prizes!!! Just to make it more drool worthy the day the Challenge blog opens (April 5th) we will have a random drawing April 5th of one of the followers for a Fabulous Prize. So do NOT MISS this!!! Danni Bindel, will be leading this NEW Friends of SCACD DT and I am one of the DT crew . Thanks for the invitation Susana and Danni, you really make me so happy! Yeeepppyyyy !!!!!! So a whole new DT crew to demo and inspire you :o) Check it all out HERE and Follow Now so you get the updates as we quickly approach the debut!!! A New SCACD stamp release designed by the wonderful Victoria Case – Sweet Meets Sassy!!! The new images are so amazing and beautiful. I am sure you can find something what you love.